Engine failure, fuel malfunction. Maybe even a bird strike. The official finding of what caused of the F-16 to crash that crashed after performing for the Air Force Academy’s graduation ceremony Thursday has not been released, but experts and pilots are giving major props to the pilot of the No. 6 Thunderbirds jet, Maj. Alex Turner, for a safe and impressive crash landing. Turner, who released following a medical checkup, was not available for comment. But those who know flying were impressed with his piloting skills. "Those guys are really, really good at what they do, and this particular pilot, especially so," said John "JV" Venable, commander of the Thunderbirds from 2000-2001. Venable, in the Air Force for 25 years, flew F-16s throughout his career. "When he took up the glide path toward Peterson [Air Force Base] field, he did everything he could to save the airplane, and when he couldn't, he put the airplane in the position where it could glide," said Venable, who retired from the service in 2007. "It's why the airplane looks so extraordinarily intact following this mishap." The Thunderbirds' afternoon started out with the ceremonial flyby, a staple for the Academy graduations. This year, President Obama was the keynote speaker, his last commencement speech for a military academy as commander in chief. The Thunderbirds likely did a demonstration afterward for the people in the stands and outside the stadium near Colorado Springs, Venable said. Before returning back to Peterson's flight line, somewhere in that stretch a warning popped up. "As No. 6 was flying around, somewhere in there he got a warning light, or a shake, shudder of his engine where you could feel it…and what he likely did was zoom his aircraft up and begin to try to restart the motor," Venable explained. 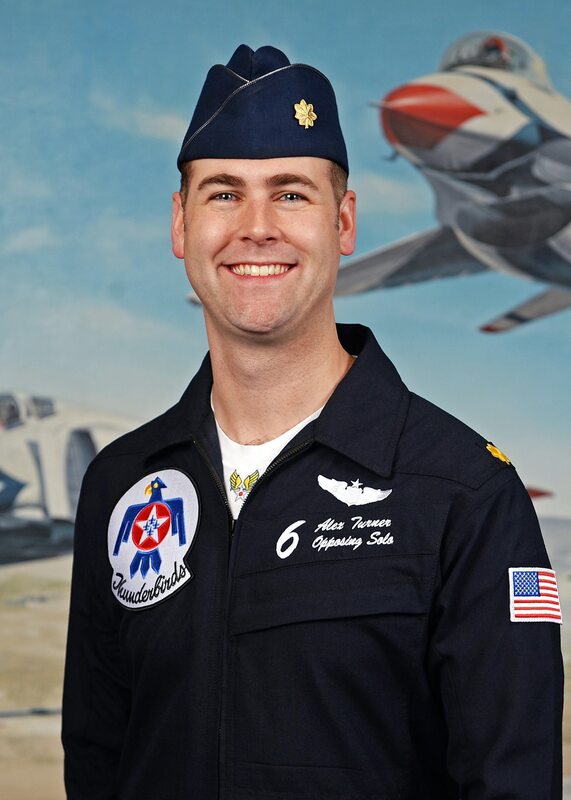 Turner joined the team in October 2015 and has logged over 1,200 flight hours as an Air Force pilot, with more than 270 combat hours over Libya and Iraq, according to the Thunderbirds' website. He needed to climb before he could lower himself into a good "glide ratio," which pilots do to maximize their distance before coming into a base runway even if there's a mechanical problem. Turner just came up short, but veered into an open field just south of the Colorado Springs airport, where he could also safely eject. "Anytime a pilot ejects, we always try to go down into an unpopulated area," Master Sgt. Chrissy Best, a Thunderbirds spokeswoman, told Air Force Times Thursday. The moment Turner traded in his air speed for coasting at the right altitude — around 8,000 to 10,000 feet - above ground level — is perhaps what saved the situation from becoming worse. off. "We practice this all the time in the F-16," Venable said. "When you're in a low altitude environment, you zoom your nose up to 30- to 40-degrees nose high, try to get as much altitude as you can, with the air speed that you have, and then you push the nose over to catch an air speed of around 210 to 250 miles per hour." In a combat situation, if a pilot notices a mechanical error, he can push an emergency jettison button – to dump his external fuel – to lighten the aircraft and help it glide. The Thunderbirds, considered "clean F-16 jets" because they do not carry missiles or bombs, also only have an internal fuel system, according to the Air Force. Internal tanks cannot be dumped, so that fuel tank "is with you until you burn it or land it," Venable said. The F-16 can hold 7,000 pounds of jet fuel. Local media reports said that the area had been closed off due to spays of hydrazine, a type of jet fuel that powers the emergency generator on the aircraft, in the area. In case the engine quits, hydrazine, known to be very quitetoxic, will power the hydraulics of the aircraft. "My hat's off to this guy, because he did exactly what he's supposed to do," Dan Hampton, a retired Air Force lieutenant colonel and former F-16 pilot, told the Colorado Springs Gazette. "Instantly, he has to react and react correctly – and he did." Turner wasn't left up there alone. His wingman – perhaps jet No. 5, the closest to No. 6 – helped out, as wingmen are supposed to. In any fighter jet concept, pilots have a buddy, a wingman, who can help bring them in in an emergency. Venable said the wingman can help steer by telling the desperate jet to turn right or left a certain degree, help read a checklist before an emergency landing or ejection, and most importantly, give a signal when to best bail out of an aircraft. "We do a countdown to a point where you get to 2,000 feet and … we [radio over] and say that if you are not able to recover … or land, we count it down, and say, 'You are at 2,000 feet, recommend ejection'." ButThe reason for ejecting could be a force of nature — literally. Bird strikes, when an aircraft hits an individual bird or a flock, or a singular bird, are fairly common. can happen more often than not. For example,Bird and civil-aircraft collisions in the U.S. jumped from 1,748 in 1990 to 9,730 in 2011, according to a 2012 Federal Aviation Administration and Agriculture Department report. Damages can amount to about $700 million annually to both military and commercial aircraft. If Turner heard the motor grinding back behind him, his plane could have guzzled up a bird. "There are hawks and eagles out there that are just monstrous [in Colorado]," Venable said. Venable hit a bird in the late 1990s, doing Mach 1.2 (about 920 miles per hour) right on the nose, on the radome, which hides the aircraft's radar with a nose cone. "The bird exploded into the radome, came up between the cockpit and the radome, and you could see ... feathers everywhere," Venable said. The Thunderbirds will not fly for some time given the accident, a spokesperson for the Thunderbirds told Air Force Times Friday. The official did not specify when they'd be up and running again. For more information on the pilot's condition and our show season, please visit https://t.co/jF4WuSr5Zl. As for Turner, he was medically evaluated after first responders scooped him up from the scene.In a fortunate turn of events, Turner was able to meet Obama for a quick chat after the president learned of the mishap. He thanked him for his service.